Never in my life as an upcoming nerd or geek would I have imagined it being cool. Being a nerd and/or geek was shunned in my formative years as a student in lower education institutions. Talking about gaming, technology, intergalactic activity and a desire to participate in aforementioned list made us an automatic target for wedgies, revile conversation, smear campaigns, and, in extreme cases, having to defend ourselves in courtyards after-school. Being nerd also had its perks, especially in the realm of academics, which is all that really was of consequence to us gain of mega-brains. We excelled at subjects that other found difficult to wrap their diminutive brains around making us favorites of the Academia. We were doted over by teachers, counselors and the school for raising their national rankings on the catalog of premier schools. We were often sought out by fellow classmate/schoolmates for help with homework or test tasking tips to help the academically ailing cure their stupidity "disease". But, the being a nerd has not stopped there. 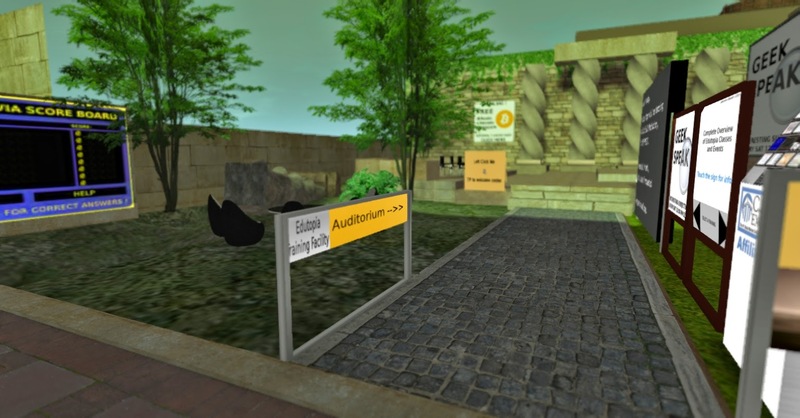 We are now sought out on the Second Life platform by Geekspeak, created and owned by Erik Goff. I could not manage an interview with Erik as the man is extremely mobile, meaning busy. But, Kathen Othobide has graciously step in as a proxy for this article to provide some insight for the weekly Saturday (This day was named after Saturn, the Roman god of agriculture) meetings held at 12 PM SLT. I originally held in my mind an image of a great amphitheater-not really- where all intellects gathered to hold a forum, and I was not completely off-kilter. 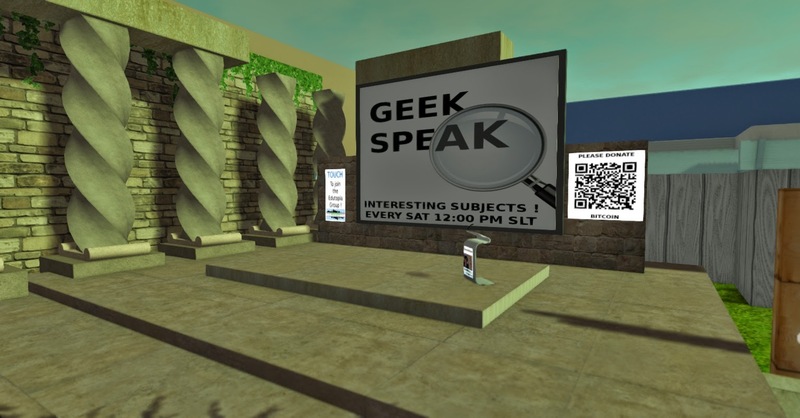 Geekspeak is a discussion forum, sans the amphitheater, where mind stimulating conversation is fostered. Conversations on technology: old, new, and future, are served hot and ready to digest. The most popular conversation I have come to find is interstellar discussion threads. And, looking at the current global situation-Pssst! The purported decay of the O-Zone layer-I can see why asteroid mining and colonization of Mars are the hot topics. If galactic discussion is not your thing, fear not, there are other conversation that are more "down to earth", so to speak. There are ongoing conversation about the portended centralization of all individual governmental entities into one global government and economy, shattering international borders. And, according to Kathen, conversations about the Bechdel test-a test used to measure a fiction literary work for conversations had between two female characters that is external of the abject subject of men. And with there are discussions surrounding the ideation of life lived in virtual worlds, plausibly eliminating human interactions. Kathen has thoroughly sparked my interest. This discussion forum sounds like my kind of Saturday afternoon spent well, once I dial down on my social calendar. 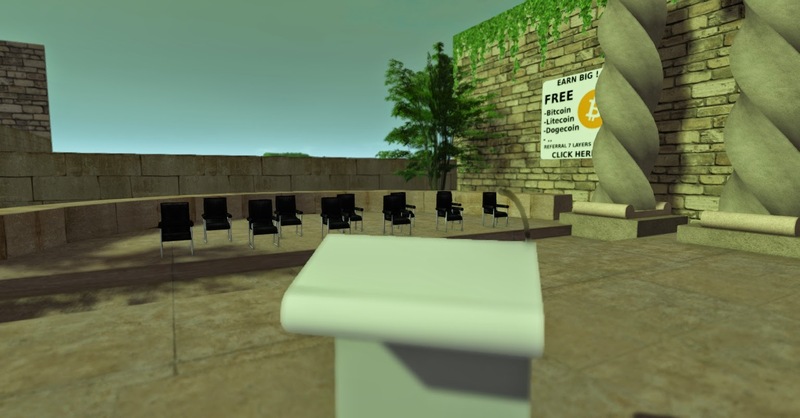 The discussion forum could be the setting to bring up Second Life discrepancies and concerns, as such conversation pertain to Geekspeak. And before closing, beyond the discussion piece, Vulcan Viper instructs classes as a joint effort with Geekspeak. For information, feel free to drop him a note card.